If you watch a cat who’s eaten some catnip (Nepeta cataria), you’ll observe that there’s an initial rolling-rubbing-wriggling response, usually followed by a bout of “the zoomies”, and then a contented curl-purr. There have been many theories over the years about exactly what catnip does to cats and why they like it so much. Some posit the nepetalactone constituents from the herb are similar to cat pheremones, and trigger a sexual-interest reponse. The common response behaviors make sense in that light – on the other hand, these behaviors are observed in both male & female cats, both neutered/spayed and intact. So it’s probably a bit different from “this plant smells like a cute tom/tabby” per se. In any event, we consider catnip to be good for cats. Because cats have such an elevated interest in the herb, we think it’s a good idea to indulge our domesticated friends every now and then – it refreshes their relationship with the wilder world, and gives them a chance to explore something not created and shaped solely by human hands. If you get catnip for your cat, make sure it’s high quality. We give our cats the same organic catnip we put into our tea – because, yeah, it’s not just for cats! Catnip is a friend to humans, too. We’ll get into that next, but the simplest take-home message is: when you need some help settling in to a comfortable, purring place… try catnip. Catnip is a gentle but effective digestive stimulant, boosting the production of digestive secretions throughout the gastrointestinal tract. The aromatic warmth of catnip helps to move gas out of the gut, which relieves internal pressure. That’s important for heartburn sufferers, because excessive intra-abdominal pressure is a major contributing factor to heartburn. 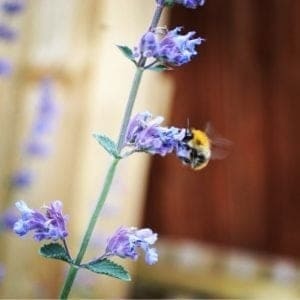 For this reason, catnip is one of the herbs I always think of when someone suffers from heartburn, especially if the person also suffers from anxiety. Like motherwort, catnip is another aromatic mint-family Lamiaceae plant, and the leaves & flowers are the medicinal parts. You can make a simple hot infusion – or start with that, then cool it and drink it iced. If you have good-quality herb, you can even prepare this as a sun tea. (It’s another hot day in Boston, can you tell?) For digestive upsets in general, catnip pairs well with peppermint – though some heartburn sufferers find peppermint aggravates their trouble; in that case, try a bit of ginger or lemon balm instead. If the person has a dry constitution, better to pair catnip with linden. When digestive disturbance causes rising heat, catnip is one of the best cooling and relaxing herbs. It’s very effective for anxiety or nervousness when its source lies in poor digestive function – when your bellyache makes you anxious. This is really common! Many, many people are walking around feeling generally ill-at-ease, only because they’re not digesting their food well. The truth is, the “rest-and-digest” state is one you can get at from either end: while we usually say you’ve got to settle down to have happy guts, it’s equally true that if you help yourself digest, you’ll be better able to rest. 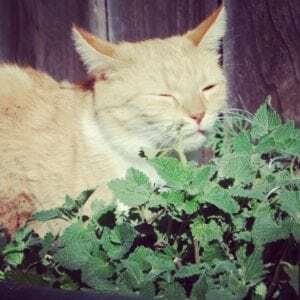 Catnip is particularly indicated when this nervous energy or upset has an upward-moving direction, as in “butterflies in the stomach” or, indeed, heartburn. If you literally “tense UP”, catnip is for you. Catnip can be helpful for panic and anxiety in adults and children, including when everyone’s worried together. 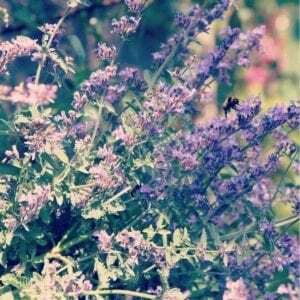 A soothing herb, catnip is a nice nervine to take before bedtime, for times when falling asleep is difficult. Pairing it with passionflower or wood betony makes sense for either of these purposes. You may have noticed we’ve described catnip as both warming (digestive stimulant) and cooling (releasing anxiety) above. That’s the mint family for you! This complex, first-warm-then-cool or warm-here/cool-there quality is not uncommon in the Lamiaceae. It’s all about recognizing change over time, and seeing how that course of changes can be helpful in a given situation. Herbal energetics is first and foremost about making good observations. Recognizing these trends in botanical families, including when there are exceptions to the rule, helps us refine our intuitions. Another thing mints have in common is antispasmodic & diaphoretic effects: releasing tension to allow easier venting of heat. In this regard, catnip relaxes muscles and the skin to allow the heat of fever (or frustration) to escape the body. 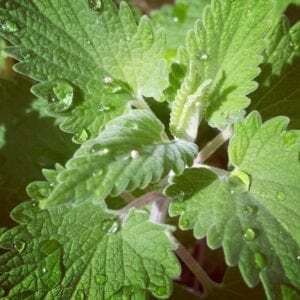 Catnip is commonly included in formulas to break a high or long-lasting fever, often along with peppermint & elderflower. PS: We have a full video + text herbal monograph on catnip (and 86 other herbs) in our Materia Medica course, which you can take stand-alone or as a component of our Herbalism 101 program.